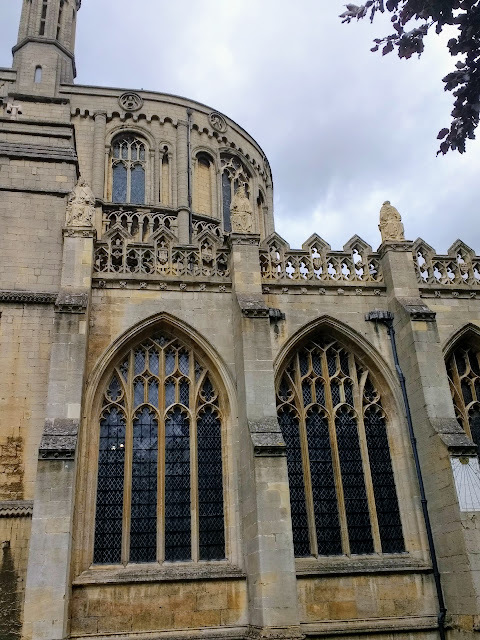 I had my lunch in the Cathedral cloisters..when uninhabited an unusually serene place given it's proximity to the main shopping drag. Once nourished, I had a short wander, circling the Cathedral. The building felt imposing and monolithic, parts of the walls black with grime. I looked for gargoyles but there were none. A smattering of graves along one edge, a sparse cemetery. Coming back along the other side I looked up. No gargoyles here either but some stranger apparitions, at least to my eyes. Four figures adorned the building. Their faces appeared weathered away, one to the point of having the front half of the head missing. From where I was standing they looked small but radiated an aura beyond their size, sort of God like, alien. They reminded me of the statue-like figures in a vaguely recalled series of episodes of Dr Who (Sylvester McCoy and Ace vintage) titled 'Ragnarok', which had something to do with Norse Gods and sinister clowns. The cathedral figures seemed as much akin to Norse figures as Christian ones, but appeared to be neither. Despite their facelessness, they looked like ominous watchers from another time. I could only get three of them into the picture, and even then from a distance. It was only later when I looked at it and zoomed in that I noticed two of them had heads that appeared to be covered by nets, or possibly hoods. No doubt an illusion of weathering but still adding to the sinister strangeness of the figures. What were they waiting for? 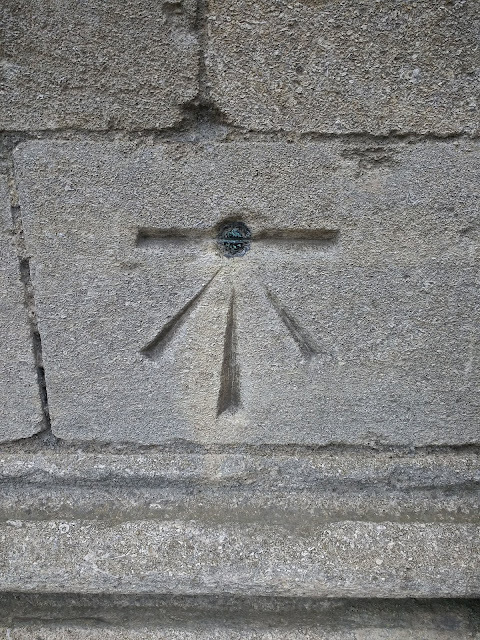 Around the other side of the building I spotted a small engraving or what appeared to be a reverse sunrise. With the solstice approaching, this furthered my feelings of unease. 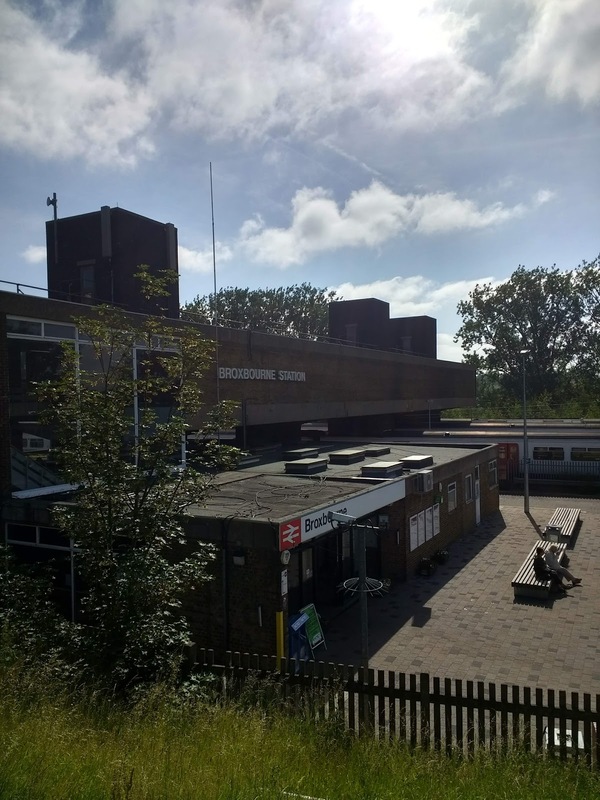 New River Sojourn: Broxbourne Station to Hoddesdon and return. Work took me to Hoddesdon, which meant a train to Broxbourne and a shortish walk (around a mile and a half). My instructions had suggested a taxi. A preposterous suggestion I thought. Broxbourne station has it's most useful facilities convienently located in the bridge over the platforms. A waiting area, loos and a couple of snack outlets. I passed through the ticket office downstairs, that seemed more London Transport than British Rail and looking back at the station from the outside, it looked as much like a tube station as a mainline station to me. It was sort of 60s 'brown box' with white plastic lettering. At first glance it seemed out of place in the surroundings, which were mainly trees. But this was Hertfordshire, the Southern end, which is a place with countryside trappings but at the same time one that has not quite escaped London. 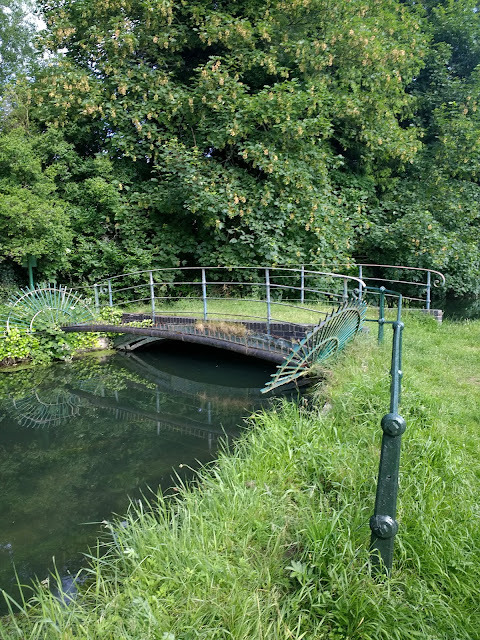 On the map, Broxbourne and Hoddesdon are part of a sort of corridor that extends into London following the New River and River Lea along the Lea Valley. The map shows no gap of Countryside between these places and Enfield, Ponders end and ultimately Stoke Newington at the New River Head. 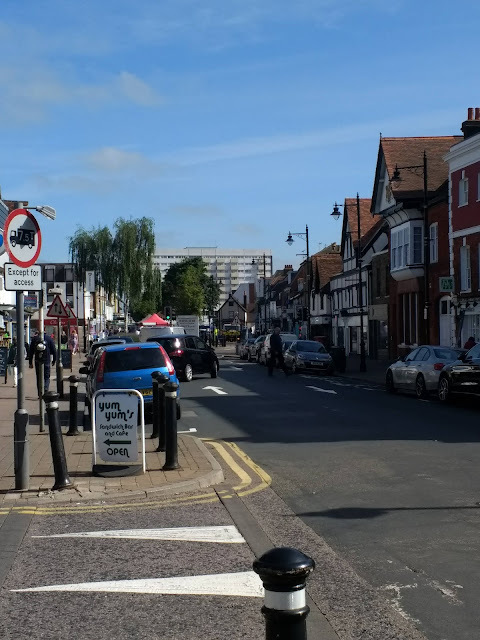 It's as if Broxbourne, Cheshunt, Hoddesdon etc al are trying to escape the metropolis, while it reaches up , dragging them back into it's amorphous edges. This 'corridor' also contains the Lea Valley Regional Park. 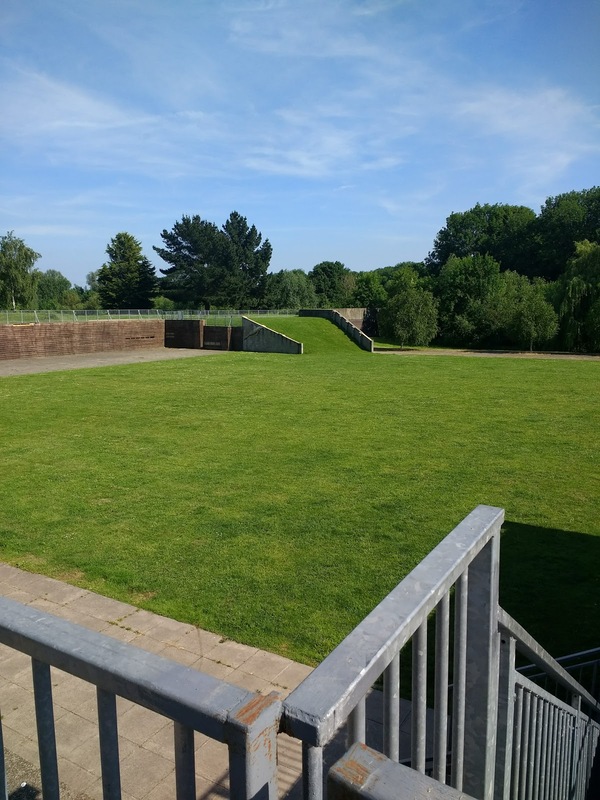 This was subject to a project we had to do at University, a sort of role play to decide how the park could be developed to attract visitors and improve it. My group were the 'developers' so our task was relatively easy, if unpallatable. We argued for a casino and lesuire complex to be built on the grounds of revenue generation and job creation. Luckily in real life this never happened. Around the same time I bought the LP 'New River Head' by The Bevis Frond which had just been released. Both New River, it's Head, and the Lea Valley park are places that only existed in my head for years, but had a sort of mythic significance due to these separate but contemporary events. 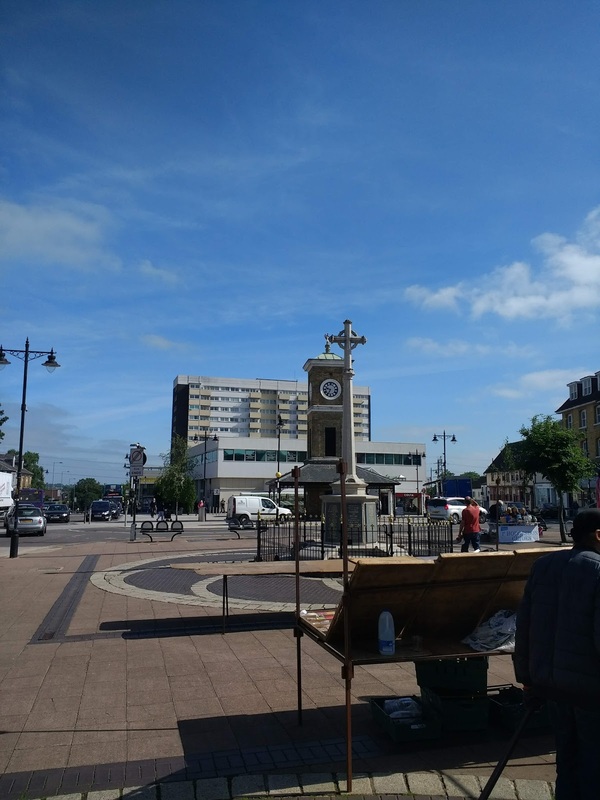 Later, the beginning of Iain Sinclair's London Orbital was set in Waltham Cross, part of the same corridor. Another place that I've never been to which only added to the myth. So the decision to follow the New River towards Hoddesdon was the only route to take, also influenced by the fact that the road route looked like it might be a bit main road-y and dangerous The river footpath was raised up above the station. A short distance along, it felt less London. No buildings, plenty of greenery etc. But still commuters and a ropey looking car park/waste land on the left reminded me I wasn't quite in the wilds. 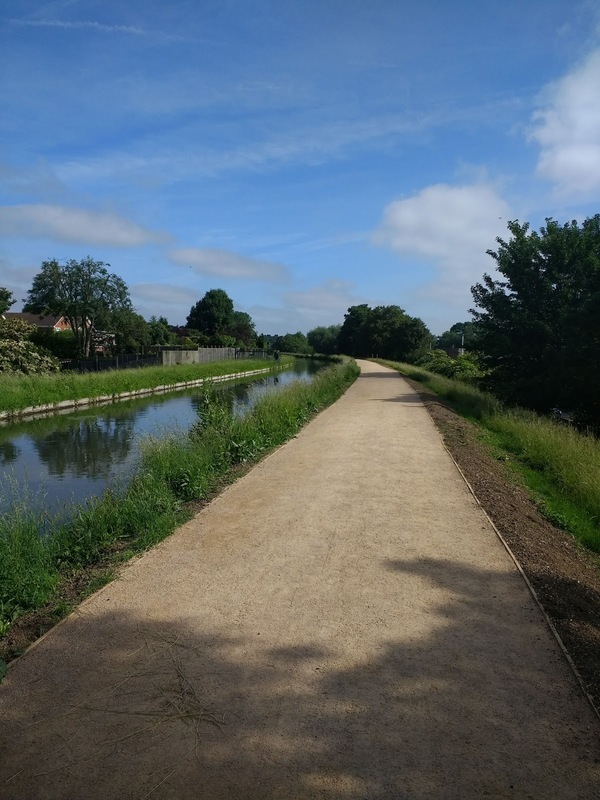 The path on this stretch had recently been widened and surfaced. A bit further up a lone workman was finishing the task. I was pulled out of my walking hypnosis by the sound of his radio broadcasting some loud tinny pop music. 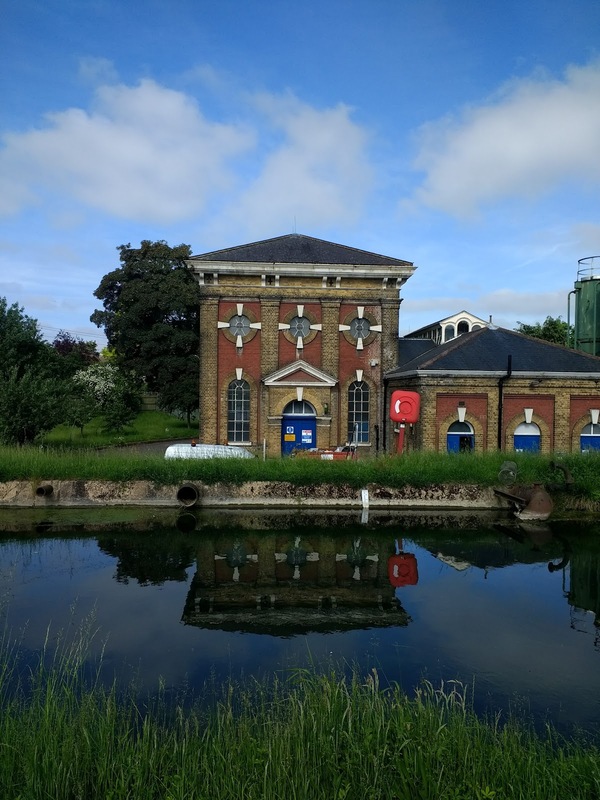 On the other side of the river was an old pumping station building, still apparently in use for something. I eventually left the path after a narrower stretch yet to be resurfaced, crossing at a green iron footbridge. This took me down a small path which soon came out into a typical looking sleepy suburban street. Apart from a skip lorry having some difficulty parking up and which eventually gave up and went away, I saw no one. I soon came across a turning into another footpath, the walls and fences strangely graffitti free. 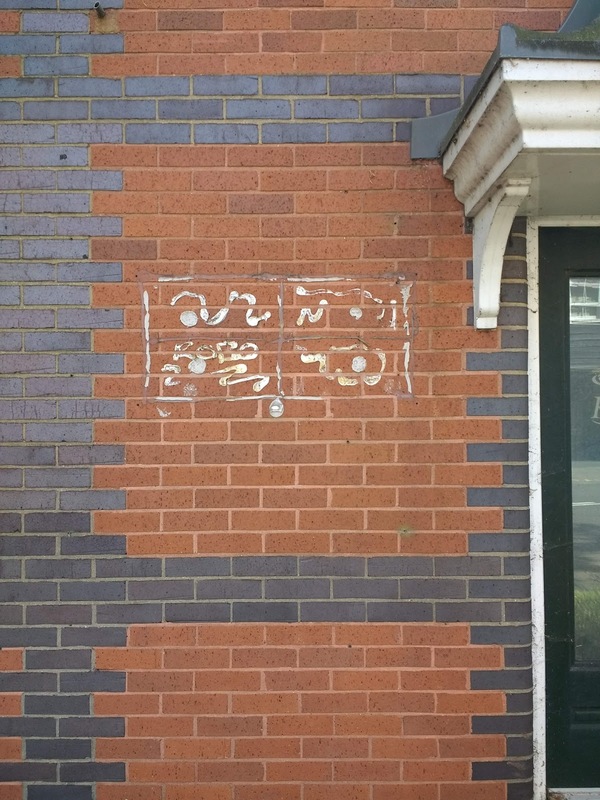 This lead past a school and eventually emerged into the grounds of what may have been an old people's home. The other side was the main road leading into Hoddesdon town centre. I followed the path through an arched construction with roses growing around it. This was typical of the sort of manicured and nanna-ish prim landscaping along this stretch, similar to many small market towns. Walking through the arch I wondered if I would go through some sort of metamorphosis and age a few years. I think I survived in tact. 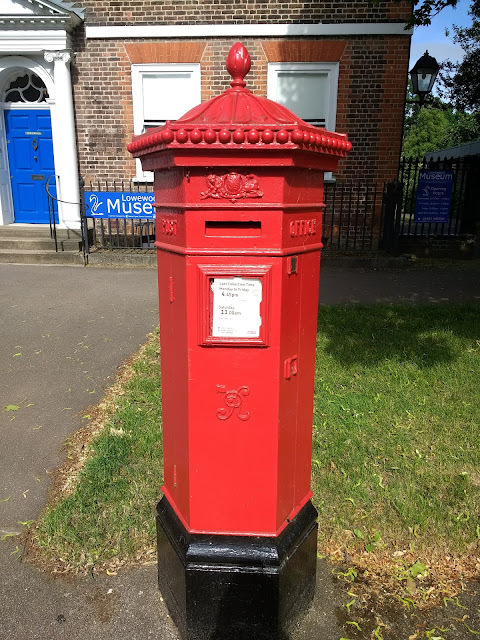 Across the street was a museum and a slightly unusual red post box, with a strangely ornate top. Pre-Royal Mail privatisation vintage for sure. Do they even make new post boxes anymore? Next to the Museum the Spotlight venue was advertising fotrthcoming attractions, from Pepper Pig to Simon and Garfunkel. A similar roster of 'stars' to those you get at Cromer Pier. Later I saw a poster for a Robbie Williams tribute act. Has-beens and tribute acts I always think are the live entertainment equivalent of a wedding disco. Hard to get enthusiastic about but to criticise feels frivolous and a bit cruel. 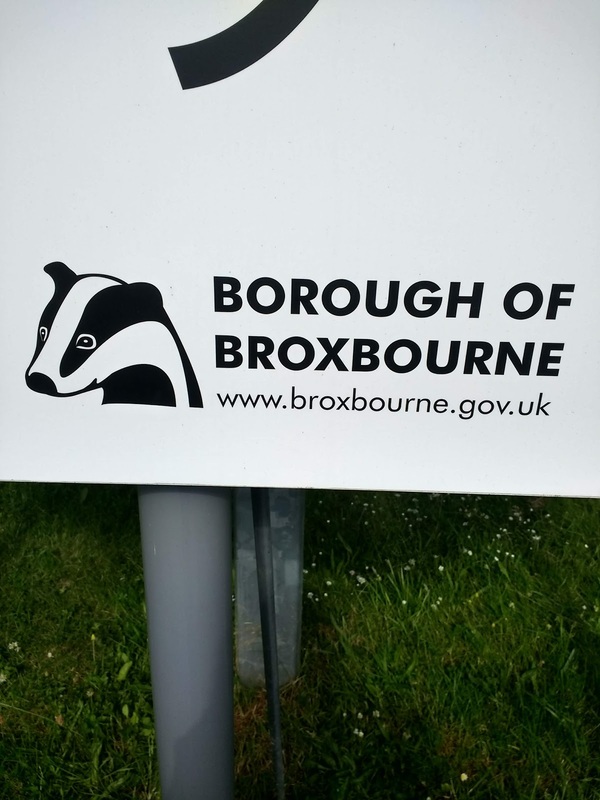 The symbol of Broxbourne Borough Council was displayed on the notice board: a badger. A symbol of ruralness I suppose. You don't hear much about urban badgers, unlike foxes. On the other hand, 'borough of Broxbourne' sounded suspiciously Greater London to me. I continued into Hoddesdon. The high street initially had a bit of what Americans call a 'quaint' feel, with Georgian buildings and oldeworlde looking pubs (from a distance). Happily, this was soon quashed with the first sight of a charity shop and a market selling real things that might come in useful rather than expensive artisan products. There was a fruit and veg stall where the man was shouting 'two punnets for a paaaahhnd'. Another man was selling 'Marks and Spencers ' duvets and pillows at very reasonable prices. Another stall sold hardware. Further up it began to resemble a car boot sale. The atmosphere was similar to a London market but smaller and with a significantly older and whiter population. 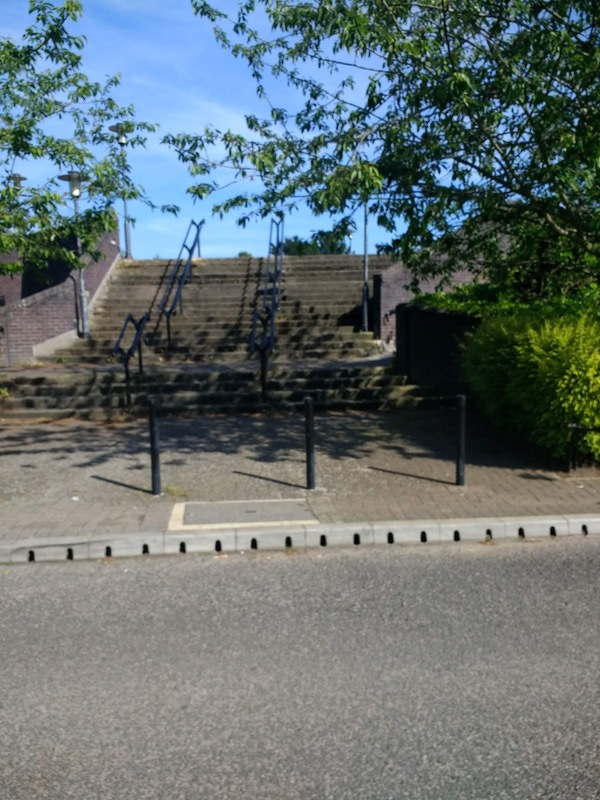 It was like being in a sort of ex-pat zone for ageing cockneys. There was even a pie n mash shop just off the main drag. Later I lunched their. The other customers mostly being some aging bikers belonging to something called the 'Lakeside Chapter'. A delegation from an Essex shopping mall. Not quite the Sons of Anarchy, more the Grandads of Retail Captialism. Ahead I could see a large tower building at the end of the street. This seemed somewhat out of character and this made it's appearance even more stark. 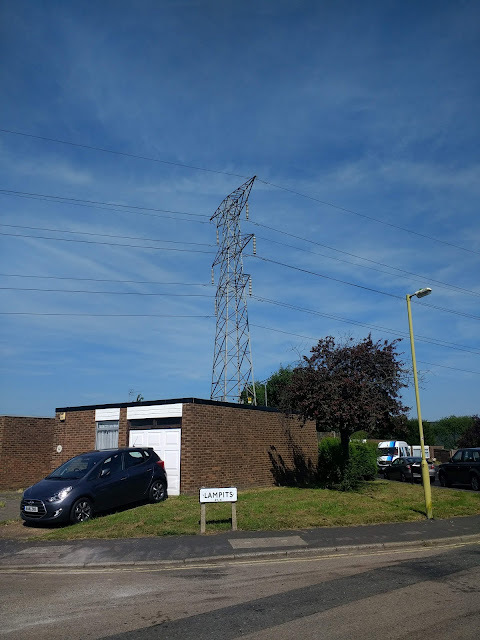 Although in keeping with the ex-pat theme I supose since it resembled the sort of buildings that proliferate along the Costa Del Sol. As I arrived at the 'tower', alligned with it in the immediate foreground was a cross and behind that a clock tower. Both dwarfed by the building which seemed both modern and decrepit in comparison to its surroundings. Closer up it became clear the building was a Morrisons on the ground floor and a block of flats above. 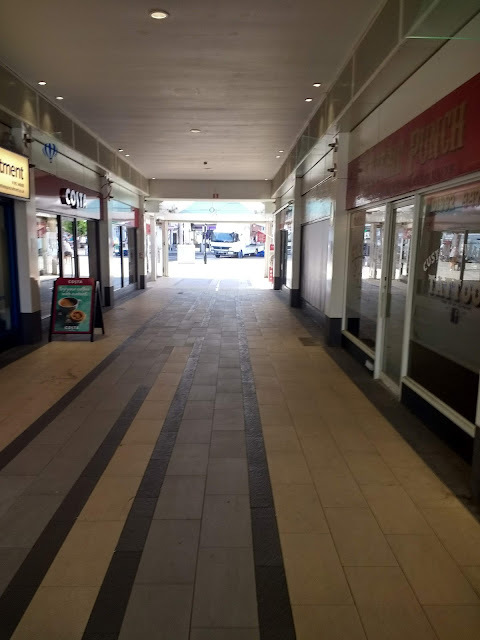 A smaller block in the foreground, titled 'The Pavilion', contained 60s style shopping arcade with offices above. The arcade contained little of interest and tiresomely a Costa Coffee. Luckily a very good, and much busier, grease caff was over the road where I took breakfast along with a number of the hi-vis jacket fraternity. Always a good sign in such places. The large Tower Building was called Tower Heights. 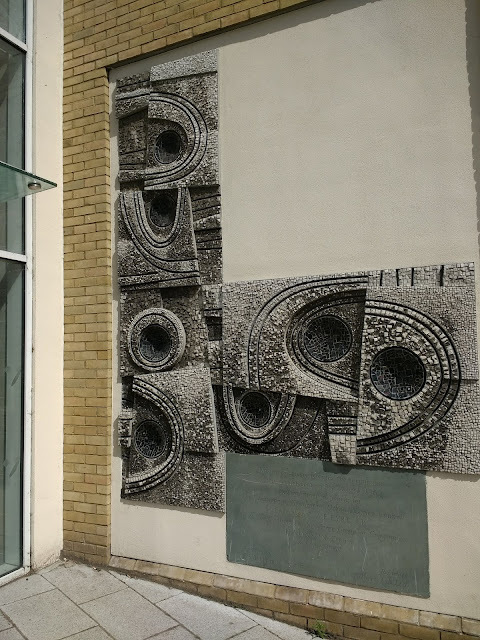 The residents access was around the side, where they are greeted everyday by concrete abstract art built into the wall next to the doorway. After my appointment, I decided to walk back to the station a different way. I turned right at the clock tower, passed a building that appeared disused, featuring some cryptic 'streetart' and a door painted in similar colours to that of the uniforms worn by employees of Greater Anglia Railways. It looked like it hadn't been opened in some years. 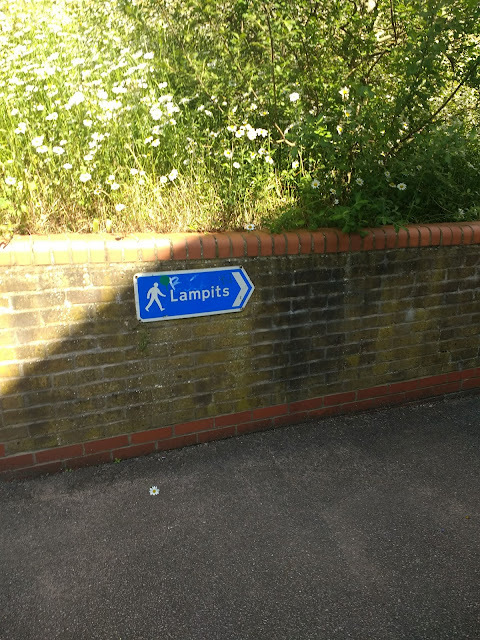 Round the corner , at a junction a sign pointed to something called 'Lambpits'. 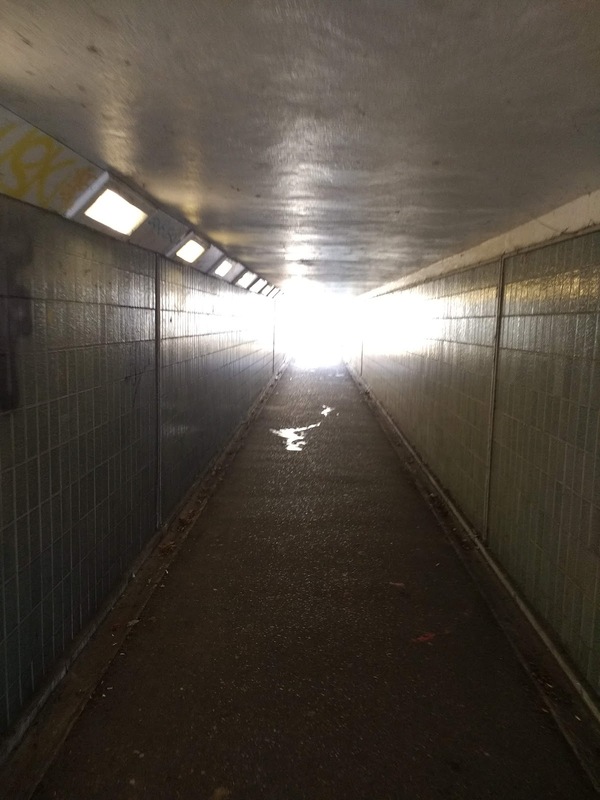 I followed it and it lead me through an underpass under the junction beyond a Sainsbury's on the corner. The area had a semi-industrial estate feel. Having emerged back into the bright sunlight, I soon discovered Lambpits. A housing estate with some slightly odd buildings. The one below looked half garage half bungalow. The pylon magnificently rising up behind it adding to the mildly sinister 70s public informstion film atmosphere. I negotiated my way through the estate, and soon found myself back on the New River Path. The first stretch was deserted and despite the unpleasantness of being exposed to the sun, I enjoyed the tranquility. I observed what looked like three purple velvet moths drifting about on the bank of the river. Closer inspection showed them to be some sort of damsel fly. They appeared to stay with me like minature guides until I reached a crossroads where the path became surfaced and widened. 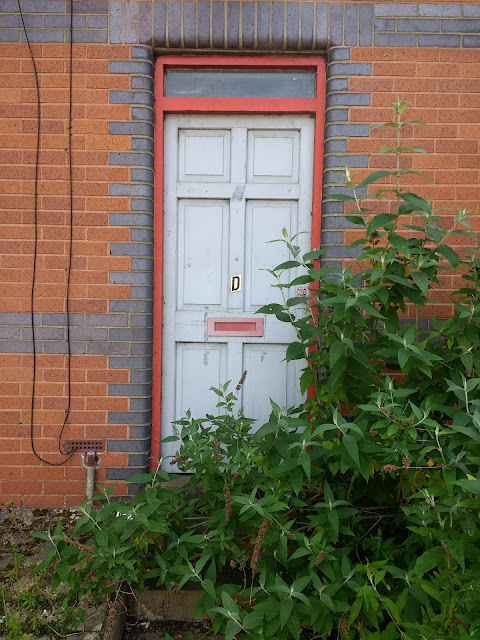 The same place I encountered the workman and his radio earlier. He had long since knocked off, no sign of him of his cohorts. I decided to turn left rather than carry on. This resulted in a brief foray into a wooded area which forked off in one direction to a small recreation ground where children were merrily charging about. 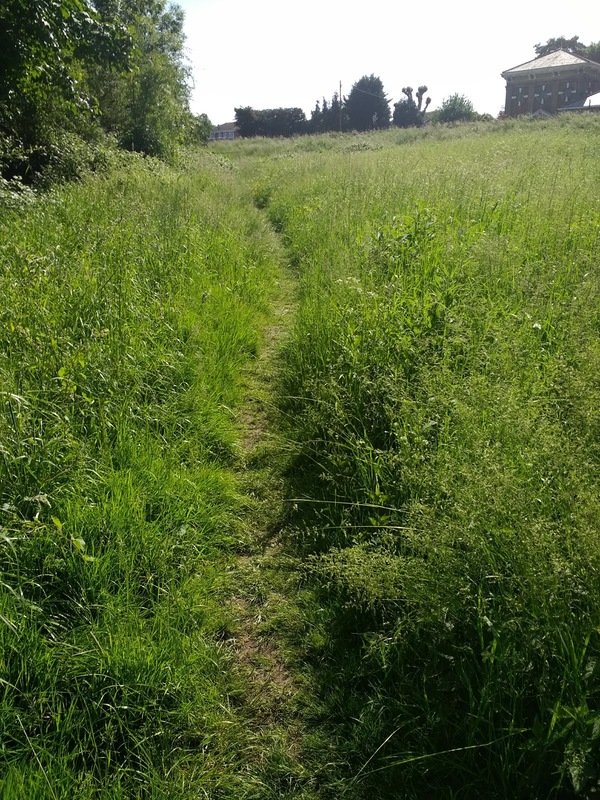 I went the other was and emerged onto an overgrown desire path. This eventually lead to a dead end, the way ahead back to the river path blocked. I grudgingly retraced my steps. I was sligy concerned that the children or their parents might think I was some sort of suspicious character. Or worse, a lost insurance salesman. Soon after this diversion I was back at Broxbourne Station. I'd just missed a train so with time to kill I resorted to google maps to check the whereabouts of the nearest pub. There was one not to far away near a marina. This involved crossing a narrow bridge with not much of a path over a busy road, before heading down a track towards the marina between a car park and a set of steps leading up to something the other side. I took a diversion up the steps and found myself on a strange concrete expanse. One side of this there were railings looking over a large green area which resembled a bizarre sports green or amphitheatre. There was no one around. It felt slightly otherworldly, as if i'd crossed a line into somewhere closely parallel to the here and now. I considered walking across the green but my thirst got the better of me. 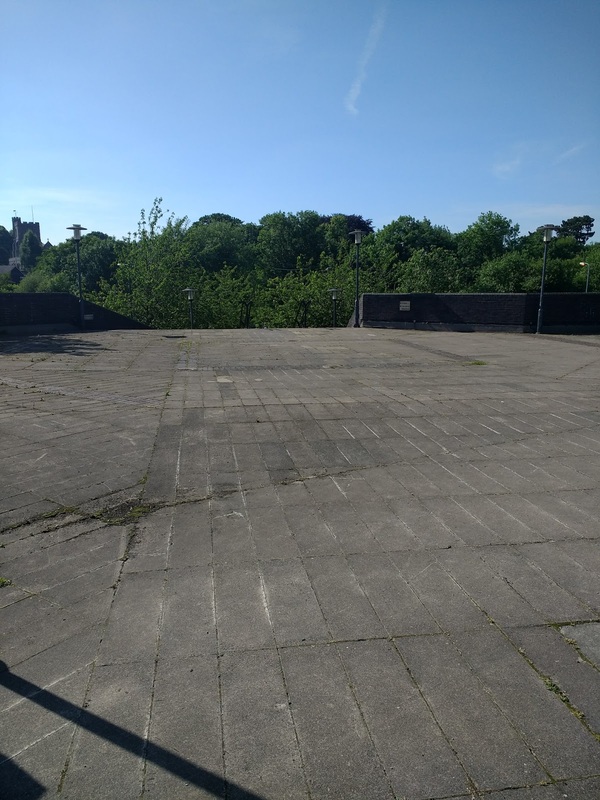 I imagine I had been above a reservoir or water works of some kind but the place was odd. I forget the name of the pub. It was a large riverside affair, cavernous with several seating areas. Aimed largely at diners, and presumably the boating fraternity. But at this time of day less than busy and the empty darkness of the interior, away from the sun, was welcoming. I rested for a while before heading back to Broxbourne Station and catching the train home.